Options page is now visible in Microsoft Edge! Microsoft released yesterday the new Windows 10 Insider build 14315 to all insiders. But what’s new in this build for the Extension developers? As you read in our previous post, there was a workaround to open this page in your Edge web browser. Now the extension developers can open the Edge extension options page direct from in the “extension” sidebar. 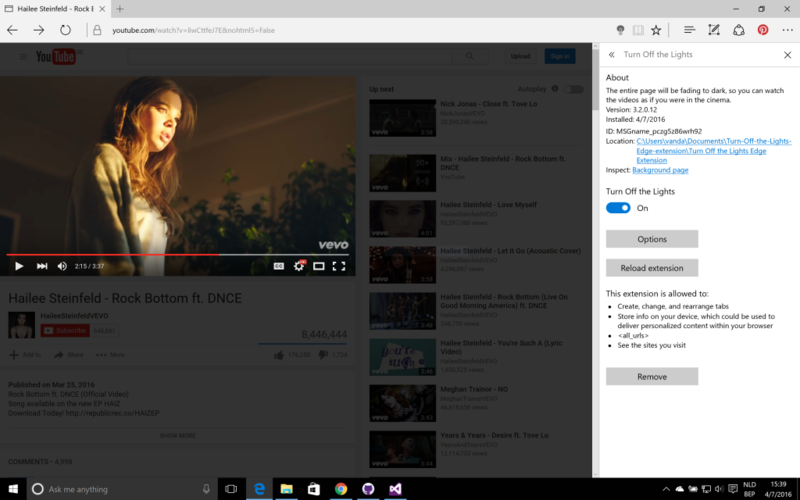 This time Microsoft Edge web browser allows you to debug the background page of the Edge extension. To open this debug window you see an extra link below the path of your extension. When you click on this link (Inspect “Background page”), you see the debug window. Need the roadmap of the Edge extension? You can find it here on that page. And to learn what extension API is supported, see this Microsoft Extension API page. Want to test the new version of “Turn Off the Lights” with the Options page? Go to www.turnoffthelights.com/edge and click on the big blue download button to download the latest version on your Windows 10 desktop computer or Surface. This Turn Off the Lights version 3.2.0.12 only works on preview build 14316 and later. We make sure this extension comes online on day one. So you get the best night and video experience. Please, if you like our work. Share it! And if you can make a donation of any amount, we’d appreciate it immensely! Next PostNext Turn Off the Lights Firefox WebExtensions Ready To Test It Out!